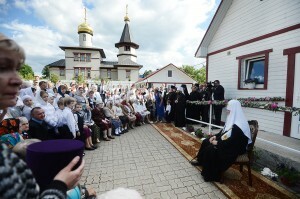 His Holiness Patriarch Kirill of Moscow and All Russia paid his primatial visit to Estonia from June 14 through 16, 2013. The official delegation accompanying His Holiness consisted of Metropolitan Hilarion of Vol0kolamsk, chairman of the Moscow Patriarchate’s Department for External Church Relations (DECR); Bishop Sergiy of Solnechnogorsk, head of the Moscow Patriarchate’s administrative secretariat; archpriest Vsevolod Chaplin, head of the Synodal Department fore Church-Society relations; Mr. Vladimir Legoida, chairman of the Synodal Information Department; archpriest Nikolai Balashov, DECR vice-chairman; archpriest Igor Yakimchuk, DECR secretary for inter-Orthodox relations; protodeacon Vladimir Nazarkin, assistant to the DECR chairman; and Mr. Mikhail Kuksov, head of the Patriarchal personal secretariat. At the airport, His Holiness was welcomed by Metropolitan Korniliy of Tallinn and All Estonia; Bishop Lazar of Narva and Prichudje; State Secretary of the Republic of Estonia, Mr. Heiki Loot; Ambassador Extraordinary and Plenipotentiary of the Russian Federation to the Republic of Estonia, Yuri Merzlyakov; and acting chargé d’affaires of the Republic of Belarus to the Republic of Estonia, Mr. Vadim Lazerko. From the airport His Holiness proceeded to the Cathedral of St. Alexander Nevsky in Tallinn. After the thanksgiving, His Holiness offered up prayers for all the saints who shone forth in the land of Estonia. That same day, His Holiness Patriarch of Moscow and All Russia met with Mr. Urmas Paet, minister of foreign affairs of the Republic of Estonia; and with Ms Ene Ergma, speaker of the Parliament. His Holiness met with the Prime Minister Andrus Ansip at his residence. After the meeting, His Holiness visited the Monument of Grief, known as the Linda Monument. A wreath was laid on behalf of Patriarch Kirill. His Holiness visited the Bronze Soldier, a monument to the Soviet soldiers fallen in the Great Patriotic War. A wreath was laid, and His Holiness had a talk with veterans and other residents of Tallinn. The Primate of the Russian Orthodox Church visited the Tallinn town hall where he was welcomed by Tallinn Mayor, Mr. Edgar Savisaar. Later, His Holiness arrived in the Pühtica Convent of the Assumption of the Mother of God. Hegumeness Filareta and the sisters met His Holiness at the holy gates. In the morning of June 15, His Holiness officiated at the Divine Liturgy in the Cathedral and delivered a homily to the worshippers. After the service, His Holiness visited the cemetery, the holy well and a museum and departed to Narva. Upon arrival in Narva, he visited the Cathedral of the Resurrection, where a prayer service was celebrated. His Holiness visited the social centre at the Church dedicated to the Narva icon of the Mother of God and had a talk with the inhabitants. That same day, His Holiness visited the construction site of the Church of Ss Cyril and Methodius. On June 16, His Holiness Patriarch Kirill of Moscow and All Russia performed a Great Blessing of the Church dedicated to the ‘Swift to Hearken’ icon of the Mother of God in the Lasnamae district, celebrated the Divine Liturgy, and addressed the worshippers. In conclusion of the visit, the Primate of the Russian Orthodox Church attended the reception given by the Estonian Orthodox Church and met with Archbishop Andreas Pöder of the Evangelical Lutheran Church of Estonia at the Lutheran Cathedral of Tallinn, or Dome Church. That same day, His Holiness Patriarch Kirill and his suite departed from Estonia to Russia. At the airport, they were seen off by Metropolitan Korniliy of Tallinn and All Estonia; Bishop Lazar of Narva and Prichudje; Ambassador Extraordinary and Plenipotentiary of the Russian Federation to the Republic of Estonia, Yuri Merzlyakov; and clerics of the Estonian Orthodox Church of the Moscow Patriarchate.